EASEL, the Easy Automatic Segmentation Event Labeler, is a video annotation tool aiming to streamline and automate the annotation process. 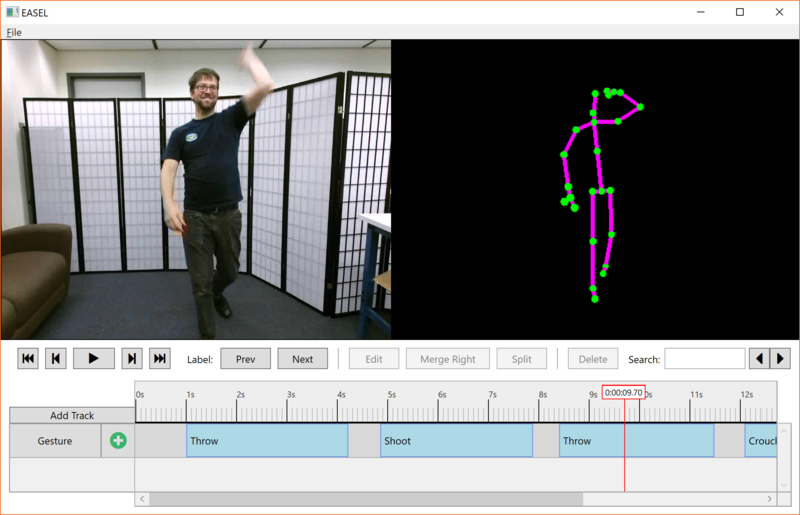 Video annotation is a vital part of research examining gestural and multimodal interaction as well as computer vision, machine learning, and interface design. However, annotation is a difficult, time-consuming task that requires high cognitive effort. Existing tools for labeling and annotation still require users to manually label most of the data, limiting their helpfulness. EASEL streamlines the annotation process by introducing assisted annotation, using automatic gesture segmentation and recognition to automatically annotate gestures.